Deflation, Gold And The 97% Greek One Year Yield. Equity markets are up across the board, but particularly Europe following a German court decision that everyone pretty much knew would happen anyway. Please consider German court reins in Berlin on euro crisis. The Constitutional Court in the southern city of Karlsruhe rejected, as expected, a series of lawsuits aimed at blocking German participation in emergency loan packages. Chancellor Angela Merkel hailed that decision as validation of her much-criticized euro zone policy. But the court also said her government must get approval from parliament’s budget committee before granting such aid and appeared to rule out more radical solutions floated by Germany’s European partners for solving the crisis, such as joint euro zone bonds. “This was a very tight decision. But it should not be mistakenly interpreted as a constitutional blank check authorizing further rescue measures,” the chief judge Andreas Vosskuhle told plaintiffs, government officials and members of parliament in the courtroom. Merkel, in a speech to parliament following the court ruling, said a radical change in attitude was needed to resolve the crisis. “I’m convinced that this crisis, if a great crisis of the western world is to be avoided, cannot be fought with a ‘carry on’ attitude. We need a fundamental rethink,” Merkel said. “We must make it very clear to people that the current problem, namely of excessive debt built up over decades, cannot be solved in one blow, with things like euro bonds or debt restructurings that will suddenly make everything okay. No, this will be a long, hard path, but one that is right for the future of Europe,” she told parliament. Jeered by opposition parties during her address, Merkel faces intense pressure from members of her coalition to resist steps like joint euro zone bonds that might reassures markets, but would also penalize Germany and reduce incentives for peripheral countries to take tough austerity steps. This is pretty much as expected, with a minor victory for Merkel in that she must only get approval from parliament’s budget committee rather than a full parliamentary vote. Nothing much has changed, except we now know some limits of the German court. 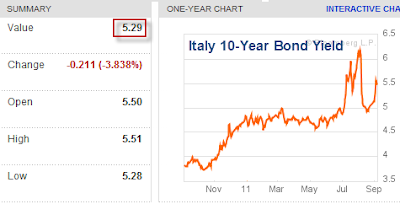 The yields on Italian government bonds is a bit lower at a still very elevated 5.29%. This should not a particularly encouraging reaction given the rally in equities. Every day someone emails me “gold is signaling US inflation”. Clearly it isn’t. Gold has decoupled from the US dollar. If anything, gold has been inversely correlated with the dollar most days, reacting to credit stress news in Europe and Swiss Franc gyrations more than anything else. Such is the case again today with Gold down $50 with the US dollar index slightly lower. If the crisis in Europe is over, gold will pull back hard, regardless of what the dollar does and regardless of what Bernanke does. However, today is just “Another Futile We are Saved” type of day. Nothing has changed, no problems have been solved, in Europe, In Japan, or in the US. 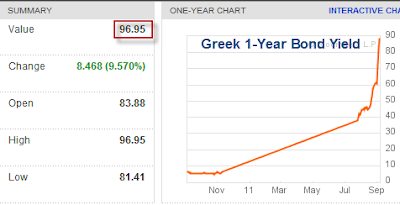 From Mish’s Global Economic Trend Analysis: Stocks Rally in Yet Another Futile “We are Saved” Trade; Greek 1-Yr Yield hits 97%, “No Blank Checks”; Gold Decouples.